Under its community development program, Green Cameroon on Friday the 3rd of April 2015 Supported 40 youths from the Mount Cameroon Forest Region in agribusiness. The 40 youths selected from different village communities at the foot of Mount Cameroon were given training on agroforestry and farm management. The training was intended to equip them with the knowledge and skill necessary for running a farm of their own as a means of fighting youth unemployment.Funded by the 1% Club from the Netherlands, “Hope from the Soil” is a project that aims at using agriculture as a means of fighting the high level of youth unemployment, high crime rates, high dependency ratio and rural exodus that is taking place in communities of the Mount Cameroon Forest Region. The project will encourage youths to get involved in agricultural activities and show them that farming can be a major source of income if practiced and embraced in a serious and systematic way. Through the project, Some 40 youths from ten village communities of the Mount Cameroon forest region were supported in setting up plantain farms of their own. The project targeted unemployed youths of ages 18 to 30 of both sexes living in the communities of the Mount Cameroon Forest Region. It will contribute to reducing poverty through the provision of jobs and a steady means of livelihood. The families of the beneficiary youths will benefit from revenue raised from crop sales. Besides the project beneficiaries, the project launching was attended by some dignitaries and interested community members. 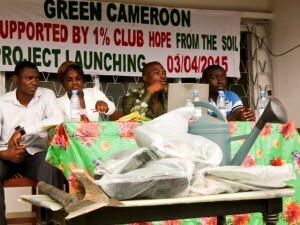 The beneficiaries after receiving their equipments and seeds, thanked Green Cameroon and the 1% Club for this benevolent gesture and promised to work hard as their own way of raising conditions livelihood in their respective communities. It is worthy of note that that Green Cameroon last year March carried out a similar initiative baptized “Hope from the farm”. Because of the enormous success recorded by the hope from the farm project, our partners, the 1% Club from the Netherlands thought it worthwhile to sponsor another phase of the project. The hope from the soil project was originally planed to be launched last year but because of some complication in the transfer of funds, the project was postponed to this year 2015. The main reason for the postponement was due to the fact that the rains had stopped falling for the year. Conscious of the fact that these crops very much depend on rain fall for their wellbeing the project team made the decision to carry it forward. 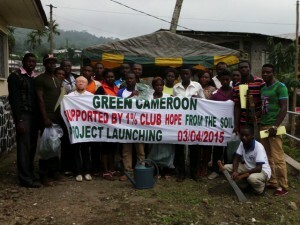 Green Cameroon hereby wishes to thank the 1% Club for their continuous trust and support by funding another of its project. It also wishes to thank all the 1% Club members who contributed towards the realization of this project. In the days ahead, we will be posting videos of the training and project launching ceremony. From the videos, you will also be able to get first hand testimonies from the beneficiaries, other community members and representatives from the Ministry of Environment, Nature Protection and Sustainable Development. Je suis déléguée du GIC ENT-DEV (Entraide et Développement) pour l’agro pastorale au Cameroun. Situé à Bomono dans le Moungo. Merci de bien vouloir nous répondre afin que nous puissions travailler en collaboration. Great work there with the youths on Hope from the soil with 1% club, congratulations. It is good to know that we have NGO’s like you close to us who are doing great work. Keep it up. The sky should be your beginning for there is a threat of famine in the air with the current climate change. In this light i wish to use this opportunity to request for collaboration with your NGO in our vulnerable community of Limbe III precisely Mabeta Fishing Port. We are faced with a lot of challenges from access to farm inputs to improvement of productivity. We would therefore be pleased if we benefit from your expertise and support to boost food production in our community.